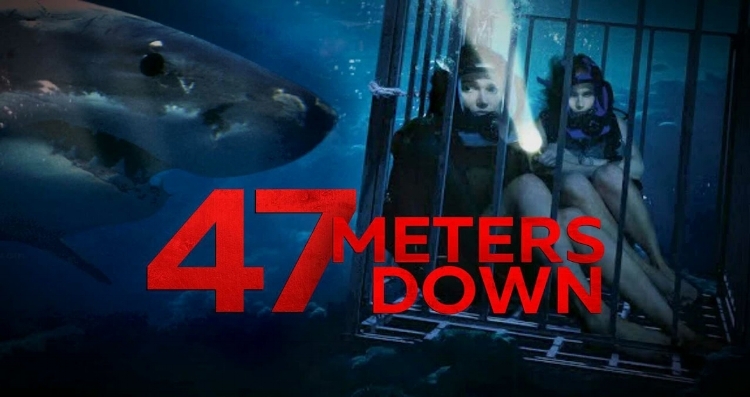 The film prominently proclaims that its Johannes Roberts’ 47 Meters Down on its opening title card, and in addition to his directorial duties, Roberts also co-wrote the film. Roberts shouldn’t be so proud, as the film only succeeded in boring and annoying me. The characters are poorly written, stupid, and unlikable. Roberts’s direction may be the worst part of the film. For a movie about killer sharks, there are very few scenes where the sharks eat people or even menace anyone at all until the film’s awful ending. To make matters worse, the few scenes with killer sharks are filmed either off screen or so close to the camera that it's hard to make out what's happening during the brief moments of excitement that separate the story’s tedium. Most of the time the sharks are off screen, enjoying their time not being featured in a movie about killer sharks. Compounding all of this is the aforementioned ending, which, not to spoil, is eye-rolling and obnoxious. Claire Holt (Left) and Many Moore (Right) right before their idiotic decisions lead to their doom. The two leads, Claire Holt and Mandy Moore actually do a decent job in spite of the material. They are written as idiotic, selfish, spoiled and shallow, which is too bad because we don't really get to know them and don’t care about them or their plight on the ocean floor. The worst part of their characterizations, however, is that they require the validation of men to be happy. Lisa’s entire motivation in the film is to make her ex, Stuart, jealous, and she even reveals to her sister, Kate, that she’s been jealous of her their entire lives because she’s been able to get men so easily. Holt’s character, Kate, actually goads Lisa (Mandy Moore) several times into going on the ill-advised and dangerous shark dive as a means of eliciting that jealousy from her ex, Stuart, who turns out to be a major character despite never once appearing on screen (only through texts does the viewer glimpse Stuart). Lisa, despite her own very rational misgivings and anxiety about the whole endeavor, is, of course, easily persuaded by this reasoning. The only area of 47 Meters Down that succeeds is the dramatic tension resulting from the two leads being trapped at the bottom of the ocean. Despite being the leads being poorly characterized, i.e. stupid and annoying, the filmmakers manage to elicit some modicum of concern from viewers, given their predicament. The natural ticking clock element of running out of air, while trapped in a claustrophobic cage, deep under the sea, obviously lends itself well to dramatic tension. But because the film is so badly paced and directed, these moments of tension are few and far between and are the result of the two lead actresses doing their best with the material they were given. It's a shame, really. This is most of the movie. Nary a shark in sight. 47 Meters Down is a terrible movie. It’s a horror film that’s not scary, a thriller film without many thrills, and a shark film without many shark attacks. The few thrills that the film does have do not make up for the rest of the movie, which is badly written and directed. The film should have sunk at the box office deeper than the quagmire that the two lead actresses find themselves in, yet, unfortunately, the film did well enough to warrant a sequel. If you’re interested in seeing a good contemporary shark-thriller go watch The Shallows. If you’re interested in hilarious camp film, watch Deep Blue Sea, or better yet, go back and watch Jaws; it's a classic for a reason. As of February 1, 2018, 47 Meters Down is available on Netflix Streaming. TLDR: 47 Meters Down is, despite its title, a shallow, badly written and poorly directed movie that offers little in the way of entertainment. 1/5 Stars.